Smart bulbs are a popular product category, but they essentially make the wall light switches useless. If you turn off the switch, the bulb will no longer work. One solution is to use a normal light bulb with a smart switch, but those can be just as expensive - though not in this case. Now you can get the Insignia smart light switch for just $14.99 from Daily Steals, using our exclusive coupon code. The switch normally costs $39.99 from Best Buy, and works with both Amazon Alexa and Siri - no native Google Assistant support, unfortunately and Google Assistant. Best Buy says it's compatible with CFL, LED, Xenon, Halogen, fluorescent, and incandescent lighting. The units being sold are new returns from Best Buy, so while the boxes may be distressed, the switches themselves are in new condition. 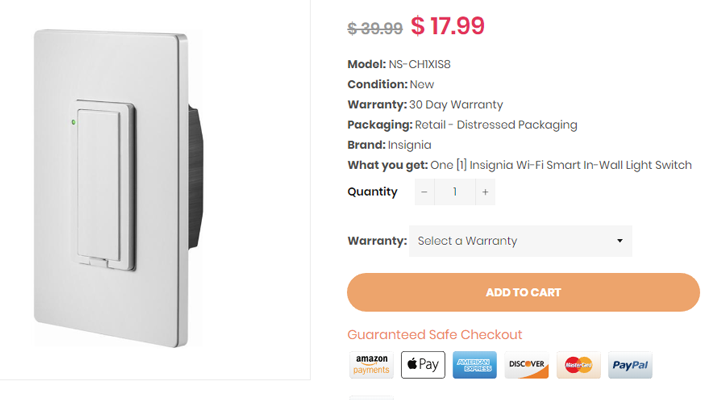 You can buy an Insignia smart light switch from the source link below. Daily Steals has it for $17.99, but if you use our coupon code APOLICEWIFI, the price drops to $14.99.